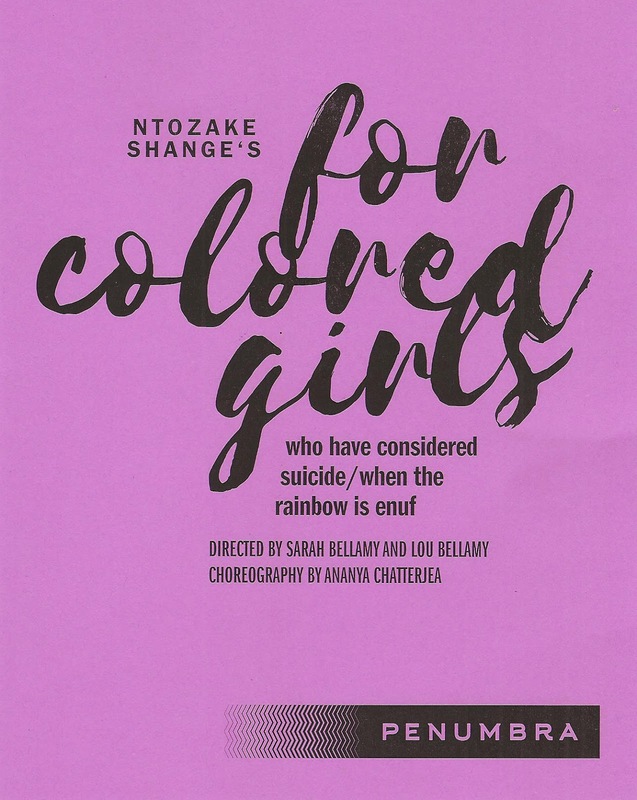 Penumbra Theatre's new production of for colored girls who have considered suicide / when the rainbow is enuf is my first experience with this acclaimed piece of theater, and now I see what all the fuss is about. I've heard the name of course, but didn't really know what it was about. Turns out it's about so much, and told in a uniquely moving way that's basically a series of poems with accompanying music and movement. 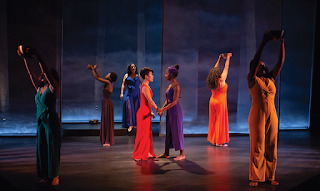 I usually have a hard time connecting to poetry, but there's something about the beauty and raw truth of Ntozake Shange's words, and the gorgeous performances by this ten-person all women of color cast, that moved me to tears. I don't have adequate words to describe why, but do yourself a favor and go see it. 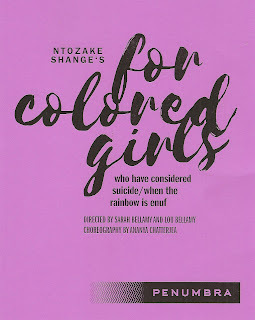 Wikipedia describes this piece thusly: "for colored girls who have considered suicide / when the rainbow is enuf is Ntozake Shange's first work and most acclaimed theater piece. It consists of a series of poetic monologues to be accompanied by dance movements and music, a form Shange coined as the choreopoem. for colored girls... tells the stories of seven women who have suffered oppression in a racist and sexist society." Wikipedia also tells me that the 1976 Broadway production was only the second play written by a black woman on Broadway (the first being Lorraine Hansberry's A Raisin in the Sun). That alone makes it remarkable, but even more so is the fact that women of color are telling their stories on stage, stories of trauma, pain, joy, hope, life. I don't think there will ever be a time when it's not relevant, but now, 40+ years after it was created, seems like just the right time to rediscover it. A time when it seems like the world is finally realizing that it's vitally important for women to tell their stories and for people to listen. The play begins with three young girls (adorable local students Eycis Maxon, Jianna Reynolds, and Quintella Rule), just sitting and chatting after school in the way that girls do. 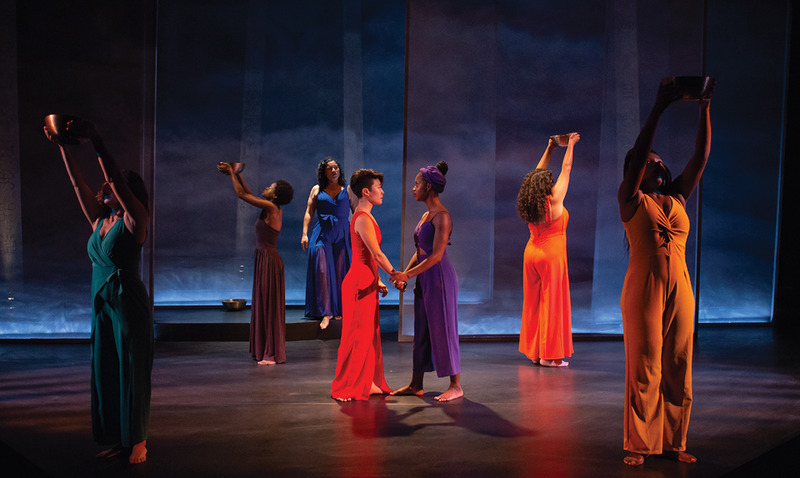 Soon seven women dressed in a rainbow of vibrant colors (Mathew J. LeFebvre's simply stunning jumpsuits) appear and start singing, dancing, and telling their stories. This brilliant ensemble (Am'Ber Montgomery, Ashe Jaafaru, Audrey Park, Cristina Florencia Castro, Khanisha Foster, Rajané Katurah Brown, and Sun Mee Chomet) pass the narrative between them, bringing these poems to life with a wide range of emotions. With direction by Sarah and Lou Bellamy and choreography by Ananya Chatterjea, the piece flows dreamily from one scene to the next, until the girls come back onstage dressed in resplendent colors themselves. The final line in the piece is a quote I've heard before: "I found god in myself and I loved her, I loved her fiercely." I've always loved this quote, but hearing it spoken by these seven different women in differently meaningful ways caused tears to run down my cheeks. After experiencing the long flowing choreopoem, this line becomes something even more profound. for colored girls who have considered suicide / when the rainbow is enuf continues through October 14. If you're a woman of color, or a woman of no color, or you know and love a woman, you need to see this piece. And that's pretty much everyone. Because women's stories and people of color's stories need to be told and we all need to listen, which is easy to do when they're told as beautifully and truthfully as this.